In this field blog, MSF nurse Trish Newport reflects on the end of her mission in Chad and the difficult reality of life in Massakory. 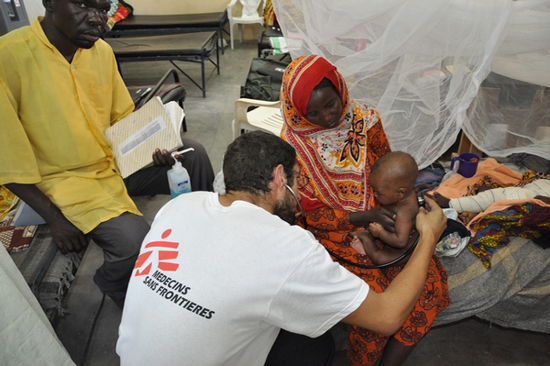 Trish Newport worked for Doctors Without Borders/Médecins Sans Frontières (MSF) as a community outreach nurse in Chad. This was her fifth mission for MSF. When not on mission, she lives and works as a nurse in the Yukon, Canada. You can read her MSF Field Blog here. Today I leave Chad. It has been a hectic ending, and I will work until I board the plane tonight—but even in all of the craziness I have had time to reflect on my last few months here, and the impact that we have as a humanitarian organization. At one point in the week I took a break with our local health promoter. We were sitting outside a tent of the malnutrition hospital, sipping painfully sweet tea, when we heard the cries of a mother who had just lost her child. We live in the hospital compound, and these are the cries that often wake me at night. Youssouf, the health promoter, said, “She cries, and then with all of the other mothers she will pray. Pray that the child will return as a bird or as a tree, but not as a human.” I pondered the cultural significance of this, wondered if it is bad luck to return two consecutive times as a human—and in the end I asked for clarification. “No one,” he said, “wants to have to do this again. No one should ever have to be a human in Chad—better to be a bird or a tree.” The words stayed with me. They gave me a better insight into why mothers refuse to have their children transferred to the hospital. As long as there are places in this world where life is perceived as so painful that parents pray their dead child will return as anything but a human, there is work to be done. On days during the mission when I have stressed about the children in our project who die, my manager has reminded me that for every child that dies in the malnutrition program, there are hundreds that are saved—and if we were not here most of the children in the program would end up dying. Now we just have to work towards making life more bearable once a child is saved. Leaving Massakory was hard. Leaving missions is always hard, but this time it was particularly hard knowing that I am going to school and won’t be on a mission again for two years. As we pulled away from Massakory I wondered about the future of our national staff and of the children and mothers in the malnutrition hospital. I wondered about the overall future of Chad. I hope for the day that when a child does die, the prayers of the mother can be different. I can hope, but hope can only do so much.